He was nominated for a 2012 Young Artist Award for Best Performance in a Television Series — Lead Young Actor. Other actors in the category included Devan Cohen (The Yard), Will Jester (Debra), Matthew Knight (My Babysitter's a Vampire) and Daniel Lupetina (The Yard). But Dylan Everett (Wingin' It) and Jared Gilmore (Once Upon a Time) tied for the win. Riggs is a huge video game fan and is clearly a Minecraft maniac. He loves the game so much he has his own YouTube channel called The Orange Trampoline and he plays Minecraft with his friends and posts the video online for all his fans. In 2012, after his TV dad, Andrew Lincoln, appeared on The Late Show with David Letterman Riggs went on a Twitter campaign to get a late night gig. He tweeted, "@JayLenoTonight Hey guys! 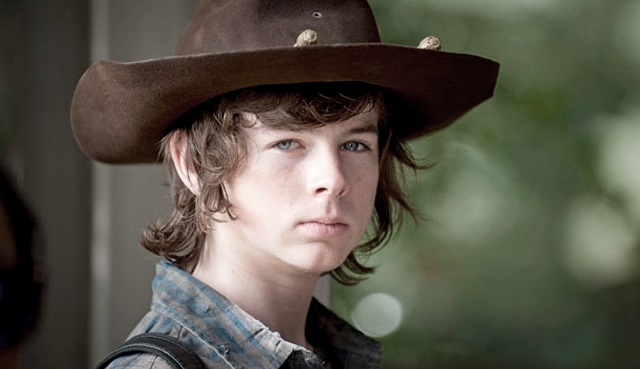 I play Carl on The Walking Dead and my 'Dad' was on Letterman last night and I would love to be on yours. Thanks!" He also made the same request of Jimmy Fallon. After making a similar plea during a Talking Dead appearance in March of this year, a petition started to get Chandler on The Tonight Show. With only 11 signatures to date, he still hasn’t made it out of primetime but he’s got time. Watch The Walking Dead when it returns to AMC on October 15 at 9 PM EST/PST.